Pedestrians May Recover Damages After an Accident | Hupy and Abraham, S.C.
Who is at fault for a distracted pedestrian accident? It is easy to see the phrase “distracted pedestrian” and to automatically think that the pedestrian who was distracted by a cell phone, a daydream, music, or something else was at fault for the accident and therefore unable to recover damages. Evidence that the pedestrian was distracted at the time of the accident may be considered when determining who was at fault for a crash. However, the fact that the pedestrian was texting, talking on a cell phone, fighting with a companion, listening to music or was otherwise distracted does not by itself establish liability. Instead, an investigation must be done into why the accident occurred. If the pedestrian’s distracted behavior was the only cause of the crash then the injured pedestrian may not be able to recover damages. But, if the evidence shows that the car driver’s actions, or inactions, were at least 50 percent of the cause of the crash, then the pedestrian may be able to recover damages. However, the pedestrian’s recovery may be diminished by the percentage of fault attributed to the pedestrian’s distraction. According to the Pew Charitable Trusts, injuries and fatalities due to distracted walkers are increasing. It is a problem that some cities and states are starting to address through education and regulation. However, it is a problem that each individual pedestrian and driver must also address. 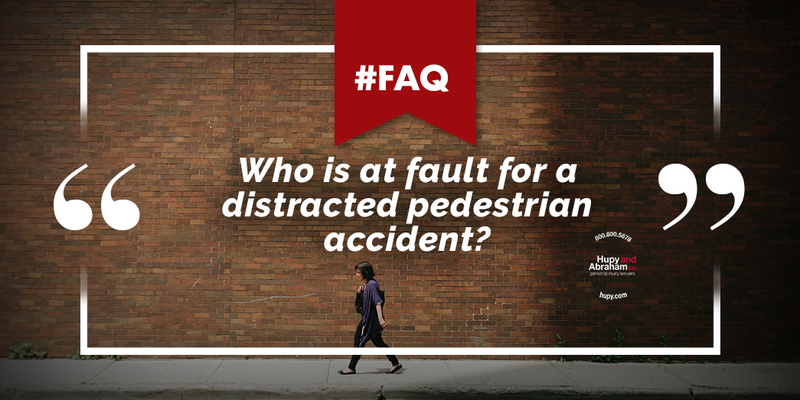 Please share this frequently asked question on social media so that your friends and followers can be aware of the risk and can learn how to protect their rights if they are hurt in a distracted pedestrian accident.